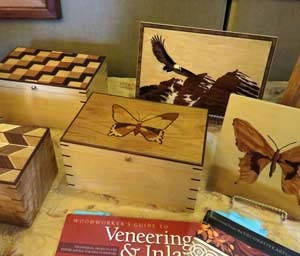 This display by the Rocky Mountain Marquetry Guild at the 2015 Gathering of the Guilds inspired a personal exploration of the art. On a Sunday early in August, I found myself wandering through the doors of Loveland’s Woodcraft store for the first time. Usually when I’m wandering somewhere for the first time on a Sunday in summer, I’m scouting for artisans at a festival I haven’t attended before. On this particular Sunday, however, I was doing something I almost never do – getting my hands into a craft to see what it’s like. This entry was posted in Wood and tagged marquetry, wood crafts on September 9, 2015 by Sally. Copper wind art by Larry Pryor stands outside Café Vino in Fort Collins. Aspen trees, cattails, and ivy thrive year round in the outdoor gallery of Sawtooth Wind Art on the southwest edge of Fort Collins. Through sun, snow, rain, and hail, they hold their own, leaves and all. 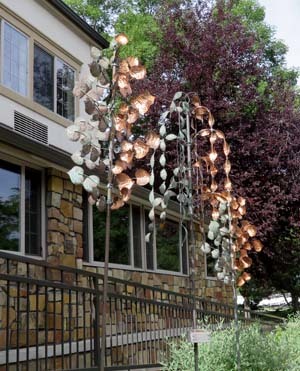 These, along with several contemporary sculptures, are the metalwork of owner Larry Pryor. If you have dined at Café Vino in Fort Collins in the last four years, you have already seen some of Larry’s work in person. Inside, his copper ivy holds business cards of the building’s occupants within its leaves. Outside, two of his aspen trees and a willow glimmer in sunshine and spin in a breeze. This entry was posted in Metal and tagged copper, wind art on August 26, 2015 by Sally. This month Handmade on the Front Range celebrates its first anniversary. In August of 2014, it launched with a four-part series on artisans who had participated in the Fort Collins Studio Tour earlier in the summer. The first of the series featured potter Susan Sternlieb, who showed me how she slumps ceramic bowls and platters. The last of the series featured Heather Bartmann and Cindy O’Neill, who introduced me to the potter’s wheel, along with Chris Wolff, a master of raku firing. Diana Begner uses self-formulated crystalline glazes for a unique look on her Pine Pottery. 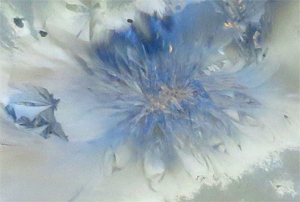 This crystal is a small detail on a platter she displayed at Evergreen’s Summerfest. Since last year’s studio tour, I’ve seen many displays of beautiful ceramics as I wander art festivals along the Front Range in search of intriguing handmade items and their creators. Always I’ve wondered what new information I might be able to share about the ceramic artists’ process. When I came to the Pine Pottery booth last month at Evergreen’s Summerfest, the possibilities became clear – crystal clear, I might say. Crystals on porcelain or porcelain-like clay give Pine Pottery by Diana Begner its signature look. Glistening randomly on numerous pieces of functional ware, they reminded me of flowers or stars or ice on my window on a wintry morning. How did Diana achieve that look? That was my first question — but that was just the beginning of what she would share with me at her studio two weeks later. 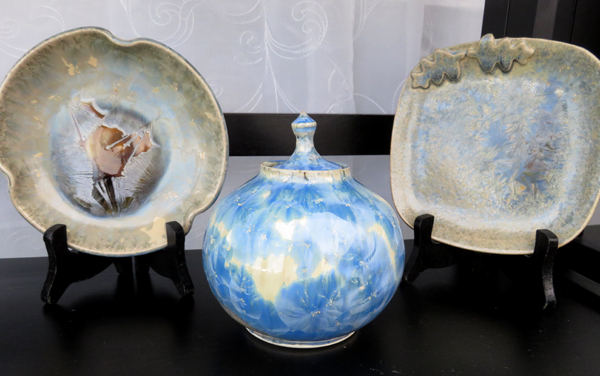 Pottery of porcelain-like clay with crystalline glazes were on display at the Pine Pottery booth during Summerfest in Evergreen, Colorado. This entry was posted in Ceramics on August 12, 2015 by Sally. Ryan Gardner shapes an amethyst on a diamond grinding wheel at his studio in Pueblo, Colorado. Ryan Gardner stood in front of rapidly whirling grinding wheels in his studio in Pueblo, Colorado. With two hands he held a long nail on which he had super glued a small amethyst. He moved the nail constantly as he touched the amethyst to the coarse surface of one of the wheels. Frequently he took time to hold the nail up where he could examine the shape of the amethyst, which was slowly changing to match the vision in his mind’s eye. This entry was posted in Jewelry and tagged gemstones, handmade jewelry, lapidary on July 29, 2015 by Sally. On the west edge of Fort Collins, County Road 38E changes from one of the city’s busiest streets (Harmony Road) to what could be designated a scenic western byway. It winds around campgrounds at the south end of Horsetooth Reservoir, nestled where the plains appear to tip up in a salute to the foothills. After passing gracefully through a sprinkling of homes on the reservoir’s southwest edge, it breaks into rolling grassland interrupted occasionally by the short but rugged cliffs of grass-covered plateaus. Eventually the road goes by the Masonville general store, where it takes the name Buckhorn Road, and soon reaches the alpaca farm of Anne and Richard Phillips. 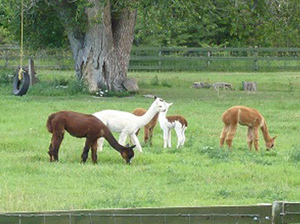 The Phillips’ flock of almost 150 alpacas can be seen grazing near the road almost any time of year. The large red barn, which looks brand new but has stood through 125 years, is used only for storing equipment, Anne told me. Alpacas become ill in enclosed spaces and do better under simple three-sided shelters. This entry was posted in Fabric & Fiber and tagged alpaca, felting on July 15, 2015 by Sally.